Government bodies in Vietnam share some common approaches to educating their young people with those in Taiwan. The Ministry of Education and Training in Vietnam, and the Bureau of Education of Ho Chi Minh City each have policies to enhance teaching methodology and administration at all levels of education. Moreover, they are both encouraging educational institutions to cooperate with educational bodies outside the country to become more internationalized. Ms. Chi-Hsi Ou, Education Attaché at the Education Division of the Taipei Economic and Cultural Office in Ho Chi Minh City therefore made arrangements for a delegation from National Taiwan University which was in Vietnam between February 27 and March 3, to visit Tran Dai Nghia High School for the Gifted on February 28. Tran Dai Nghia High School for the Gifted has established links with many European countries, America, Japan, and Australia, and it would also like to establish links with Taiwan. 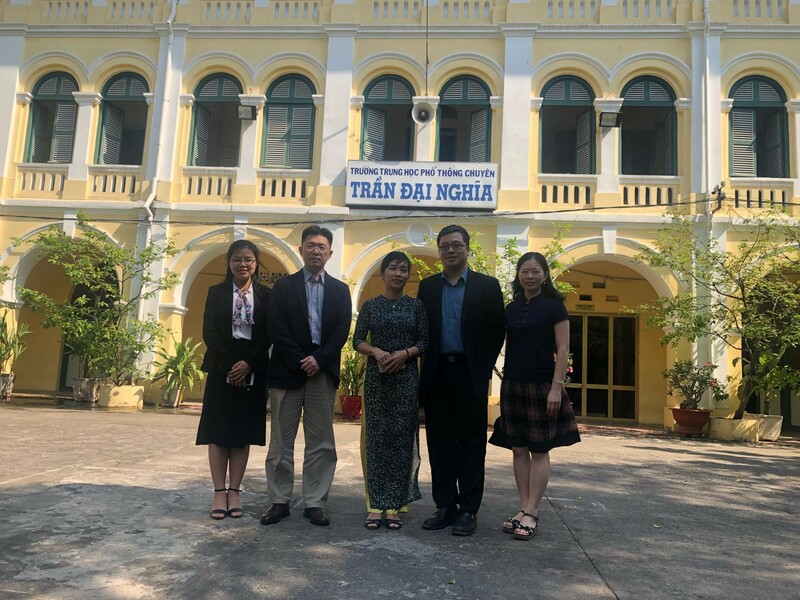 The vice principal of Tran Dai Nghia High School for the Gifted received the delegation from National Taiwan University and they discussed various possible joint programs, and the possibility of students from the school visiting Taiwan and attending summer camps there. The meeting was a great success and the school and the university plan to sign an MOU in the near future. Photo:From left: National Taiwan University delegation members Ms. Dao Thuy Ninh, and Prof. Chen Po-Han; Mrs. Tran Thi Hong Thuy, deputy principal of Tran Dai Nghia School for the Gifted; Mr. Andrew Tsung, Executive Director for Strategic Global Partnerships, at National Taiwan University; and Ms. Ou Chi-Hsi, Education Attaché at the Taipei Economic and Cultural Office in Ho Chi Minh City.